Mumbai suburban rail is one of the busiest rapid transit systems in the world — operating more than 2000 train services and carrying more than 7.5 million passengers daily. 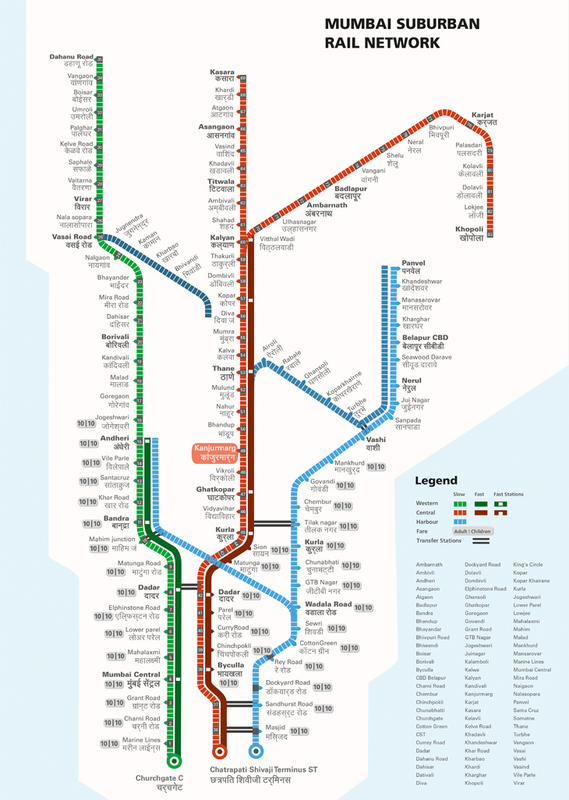 Rail maps play a critical role in providing travel related information to help commuters navigate and guide them towards informed decision-making prior to the journey. 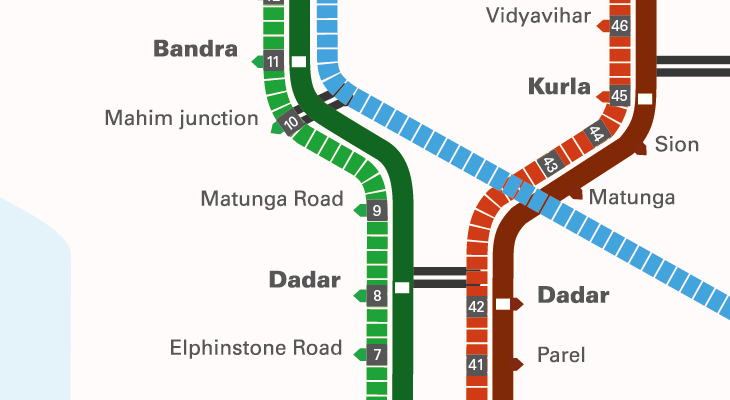 There was a need for a well designed Mumbai Rail Map. 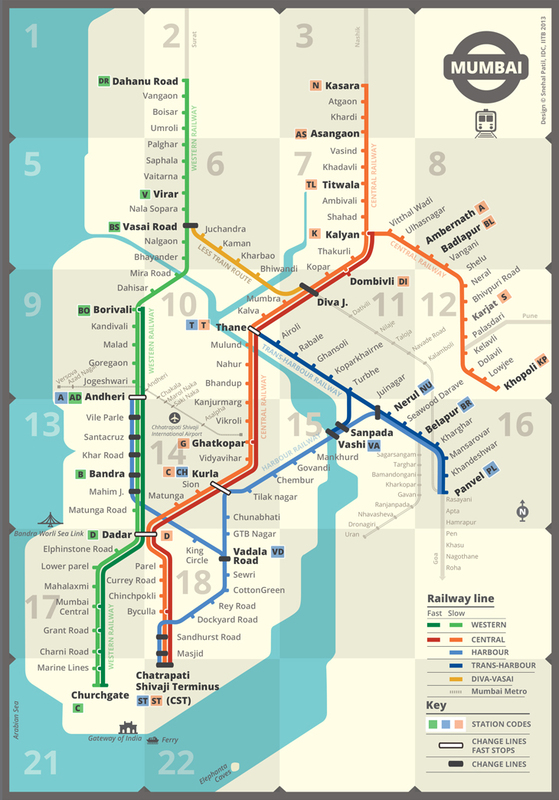 The Mumbai Rail Map (MRM) was designed at the Industrial Design Centre (IDC) at IIT Bombay, as part of the course Visual Design 1. Prof. Mandar Rane offers this course to masters students of Communication Design in their second semester. Students are given the freedom to select a design problem that they would attempt to solve in the course. This brings an ownership to the project, results in sustained levels of motivation and reflects in the rigour of their work, but there is a catch. The students can choose a problem provided they are able to prove it is one that can be addressed through communication design. Students have to justify that the problem they chose is challenging and this becomes an important exercise at the beginning of the course. To solve the problem the course emphasizes on an iterative design method, a rigorous process that requires constant questioning, debating and reworking on the designs to find the most appropriate solution. Above all, this method of persistent iteration of the design enables the students to think laterally, a skill indispensable for designers. Two Communication Design students at IDC, Jaikishan Patel (Jaiki) and Snehal Patil took up the challenge. In this conversation with Prof. Rane, Jaiki and Snehal share some of the formative thoughts that shaped the map, their iterative process, and how they addressed the issues faced in the subsequent versions of the map. 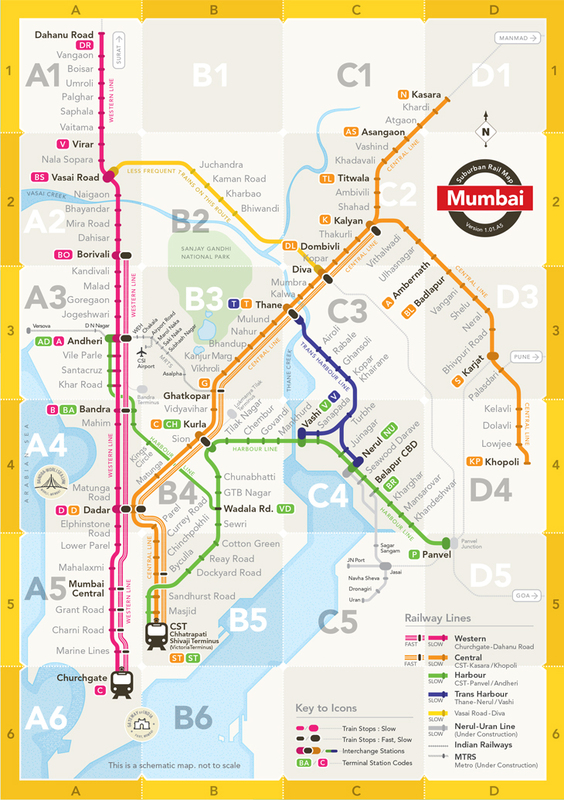 Why did you choose to design the Mumbai Suburban Rail map? Snehal: I have lived in Thane and I know a lot about Mumbai. I felt designing a map would be exciting and of value for people in Mumbai. I searched the internet and found that there are a few maps available on the internet but according to me none of them are well designed. You and Jaiki were working together, but it seems you had designed the maps individually. Later, was it merged into one? In the first map, Snehal tried numbering the stations, so even a newcomer who is not familiar with station names could navigate by minimal guidance, in turn reducing anxiety (see Fig. 1). Learning the number system is much easier than learning a new language since we get conversant with numbers from a young age, irrespective of our mother tongues and language proficiency. This happens through our interaction with everyday objects and more so with monetary transactions. Fig. 1: Numbers assigned to stations on the Western and Central Lines in Snehals first iteration. Will Dadar have two numbers? Dadar 8 and Dadar 42? The Dubai Metro, for example, uses numbers, along with names, to identify stations (see Image 2). This system would work well in a country like ours where there are so many languages. Unfortunately, managing new stations and numbers have to be implemented as a policy and was not the current reality of the system. Since the map is an attempt to represent the existing rail network, which is continually expanding and densifying, it will become problematic to number stations that may come up in-between two existing stations. The Dubai Metro is a pre-planned network of rail lines with equidistant stations and therefore has lesser probability of future alterations. Considering the current context we dropped the idea of numbering the stations and worked without it as a constraint. Image 2: Station numbers marked on the line in an on-board display of the Dubai Metro. 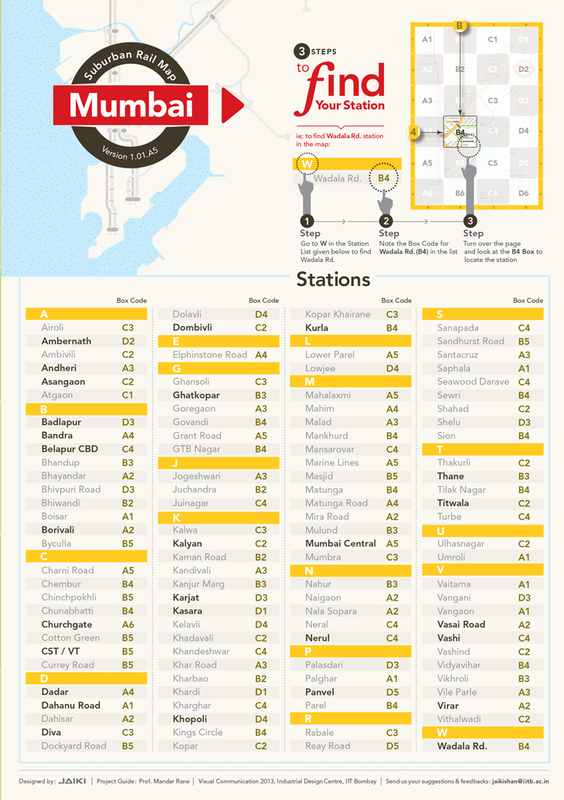 Will numbering the stations work in Mumbai's context? Snehal applied the logic of dashed lines for slow trains and continuous lines for fast trains, which was vice versa in the maps that were floating on the internet (See Fig. 2 and 3). Dashed lines, from our past experience, indicate cut lines, the ones marked with a symbol of scissors. Visually they signify broken, interspersed, intermittent and fragmentary when compared with solid lines that signify continuity and connection. When assigning line types to the rail lines in the map, it seemed most logical to assign the dashed lines to the slow trains, which is interspersed with more stations and therefore more breaks in journey. Following the same logic, the solid lines were assigned to the fast trains. This was an opportunity to define the otherwise implied meanings of dashed lines and solid lines. Fig. 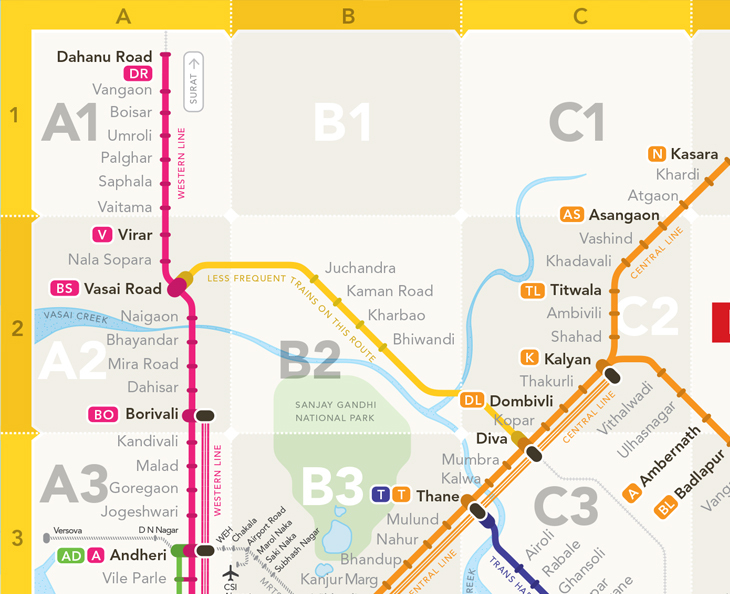 2: Map designed by Arun Ganesh from NID. 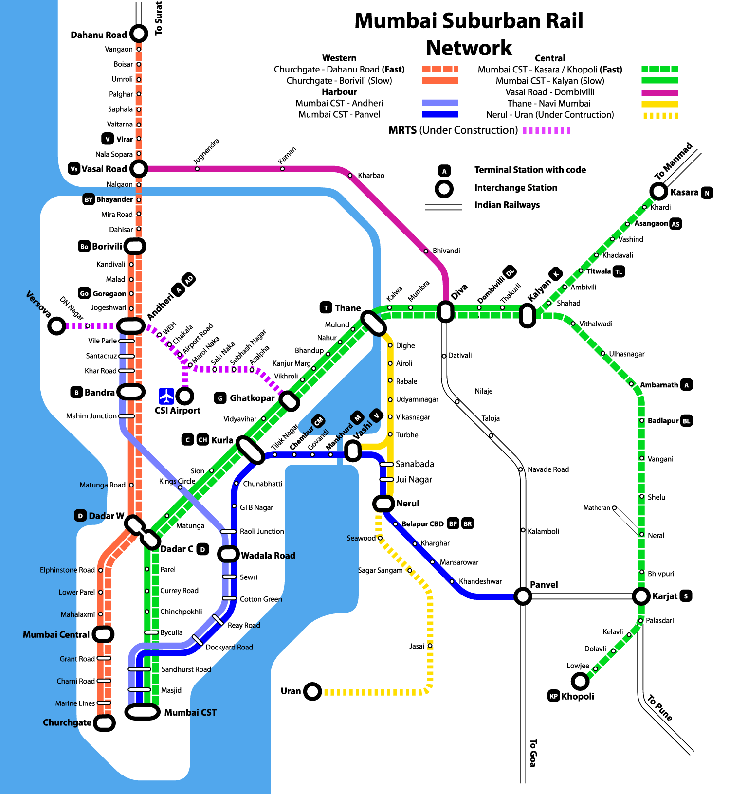 One of the few maps that reflects the attempt to design the Mumbai Suburban Railway in its totality. How easy is it to use the maps that are readily available? She did away with station numbers and tried a new version (see Fig. 4). The textured appearance of the dashed lines was found to be distracting while identifying stations and reading station names. The slow trains that were shown as dashed lines in the earlier version were changed to continuous lines. The difference between slow and fast lines was now represented by a lighter colour for the slow train line and darker shade of the same hue for the fast train. Ultimately incorporating all the routes Snehal reached her final version, later to be changed and merged with Jaikis iterations. The final map is a culmination of both the maps. Now they were a team. Fig. 3: Snehals first iteration that reverses the existing usage of dashed and solid lines. The dashed lines represent slow trains while solid lines represent fast trains. Fig. 4: An alphanumeric grid was introduced along with an index (not shown in figure) to decrease search time for stations by reducing scan area to a confined space. Fig. 5: Snehals final iteration of the map. The alphanumeric grid is changed to a sequential box grid after user feedback. The map abstracts geographical features to help the user orient himself. Jaiki: I like to travel. I have often travelled in the trains of Mumbai for no reason at all, but that I enjoy travelling. I am also fond of maps. I have the Eicher maps for all the cities and recently bought one of Mumbai. I think, you are not from Mumbai…Yes, I am from Chhattisgarh. When I came here, I had downloaded a map from the internet. There were multiple maps floating on the internet. 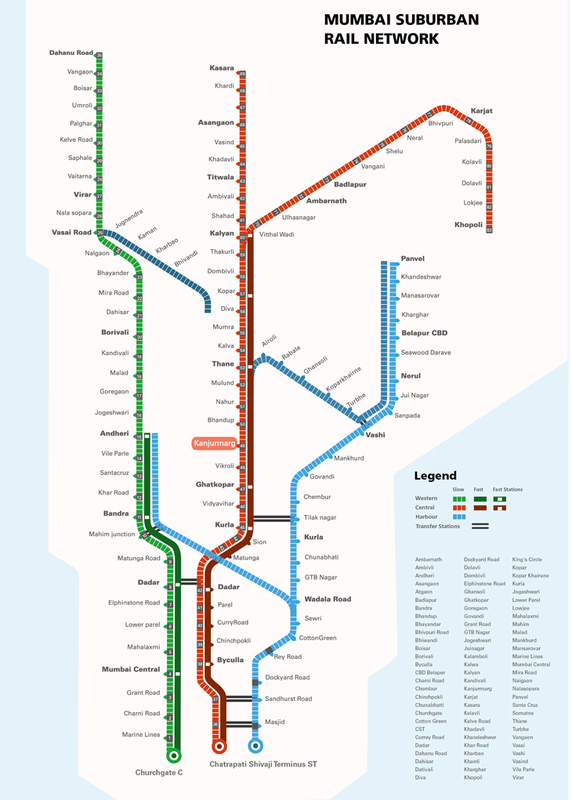 When Snehal proposed the project I thought it was a good opportunity to design a Mumbai Suburban Rail map. Then we got hooked to it. Ya, I started with the fares as I think it is useful for commuters while travelling and planning their journey (see Fig. 6). But later I found that the fares for three independent line systems, the Local, Metro and Mono Rails could not be integrated into the map as break journey fares would be required. Interestingly, the existing fare charts for the Local Trains are also line- specific and do not give fares for changeovers. 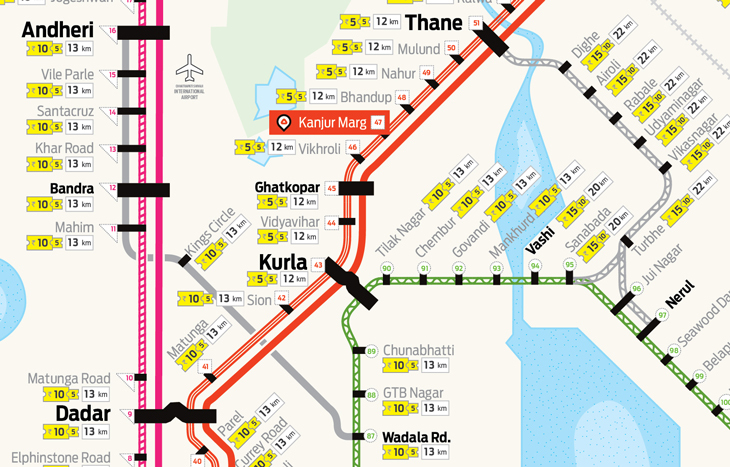 The map was initially a 'You Are Here (YAH)' map with fares and therefore Mumbai Central was highlighted, but in the later iterations we decided to do away with the fares. Fig. 6: Jaikis first iteration of the map was a You Are Here (YAH) map that also provided the fare for journeys. Different linetypes were tried to differentiate between the slow and fast lines. 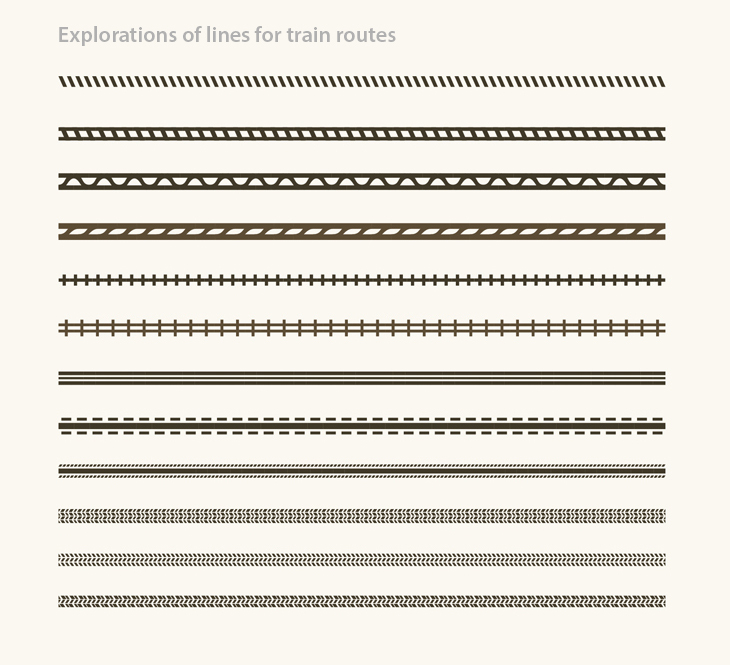 You also explored various line textures for routes and even transfer stations. Yes, it was adding complexity to the overall appearance, so I dropped it later. The Transfer icons work best when the lines pass below the shape (see Fig. 7). 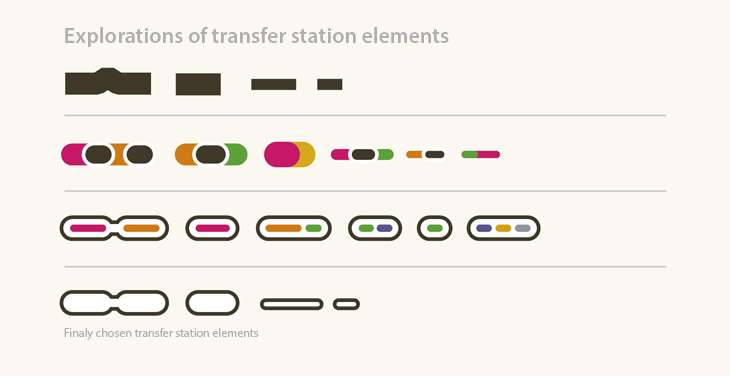 Mentioned below are a few transfer icons I explored before reaching the final iteration. Fig. 8: Version 0 of the map, complete with the Index and an alphanumeric grid, which is later converted to a simple numbered grid, and brief instructions on How to Locate your Station. Why do both of you think a map is required when people are already navigating in Mumbai? Every new traveller is introduced to the Mumbai Locals in a very complicated manner. There are four local rail lines and without an overview, confusion prevails. They are left with no other option but to ask the people around them for directions to navigate. Asking people can be a kind of risk (the authenticity of information). Therefore the user reconfirms by asking multiple people. Having an authentic map can resolve the problems people face. Travelling from point A to B is one need, but to orient oneself in the city is another. 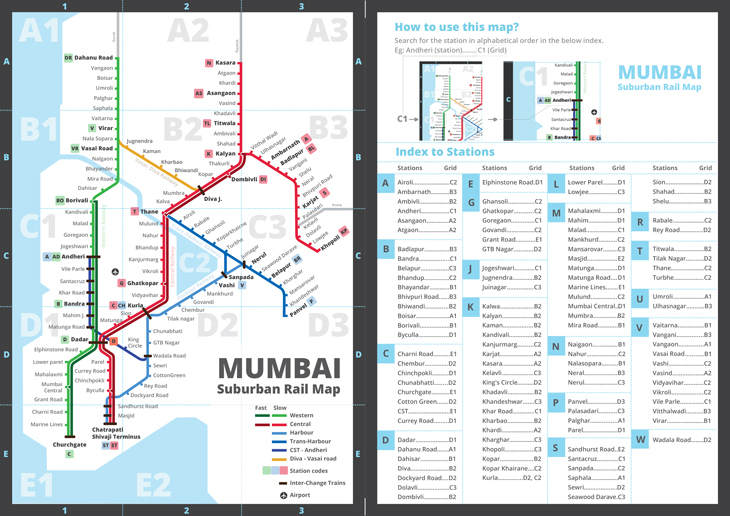 With the new design the traveller can have an overview of the Mumbai Suburban rail system at a glance and avoid detours. People were never presented with a well designed map, so to speculate whether they will use them or not is questionable. Lets give them a map and then decide. If it is useful, they will use it. 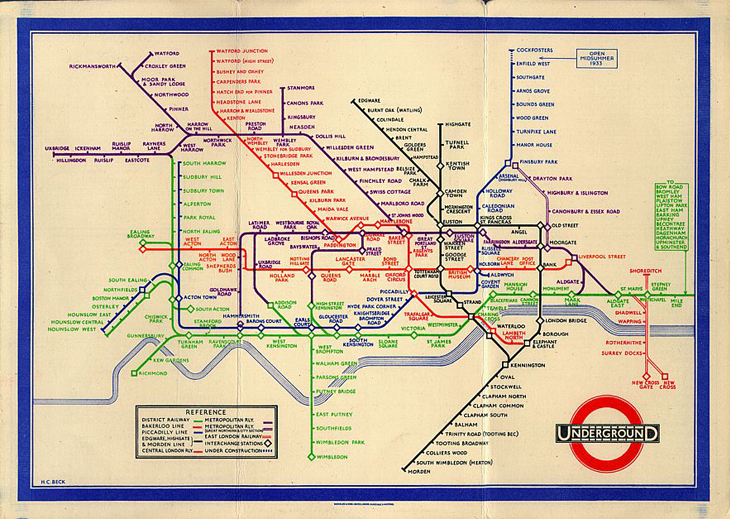 I had given you a book to read about Mr. Beck’s London Underground map, a book by Ken Garland, did it influence your thoughts? Yes, that book gave us our initial take-off point. It talks about how Harry Beck introduced colored lines to differentiate routes which are aligned in a grid and at particular angles (see Image 4). Done all the way back in 1933, this was possibly the first diagrammatic map of a rail network, which reflected Mr. Beck's training as an engineering draughtsman. The result was an instantly clear and comprehensible map that would become an essential guide to London. Our trains are not underground, then why did you choose to do a map which looks like the London underground? It just looks like one more map, what's new in it? Mr. Beck's London underground map is a visual system which solves problems of navigation and therefore we think it is not necessarily about underground trains. It is orderly and tries to reduce clutter by segregation. Navigation from one location to the other is made easier. Colour coding is introduced for proper differentiation within lines. So application of such a method to design a map helps in solving navigation problems and detours for the traveler. We thought there is no need to force a personal style in a map where working of the visual system is of utmost importance. Our map is a diagrammatic representation of Mumbai local train network mapped over slightly abstracted geography presented graphically. It shows relative position of stations along the lines. I see you have used various colours in the map, what about the colour blind population? 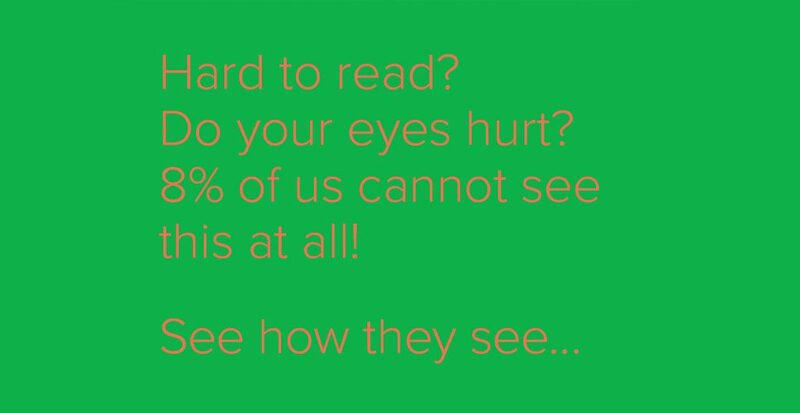 According to statistics approximately 8% of the worlds population is colorblind. We have tested the map for the same and made changes accordingly. The map uses a colorblind friendly color palette such that they are able differentiate between the various lines and geographical features in the map (see Fig. 9). In that way, the map would be still useful in case of a black and white print. Fig. 9: The image of the map on the right shows how people with protanopia see the map. Had the lines been in pure hues, they would've appeared indistinguishable from each other. Can you explain the challenges you faced in this project? Developing a comprehensive navigation system represented as a printed map was a challenge. To keep it small and portable was another (i.e. to accommodate all the lines in a small size of A5 was a struggle). The current maps floating on the internet somehow do not have an index or an alphabetical listing to search for train stations. The index and grid together increase the efficacy of navigation in the map. One can argue that Mumbai rail map is not so huge in scale and therefore it may not require an alphanumeric grid (criss-cross reference). We wish to differ on this point. We had done that in our earlier versions of the map. See earlier iterations. On one incident while testing, IDC student Vishnupriya pointed out that why use a criss-cross reference alphanumeric grid when the space is so small? She suggested why not just mention a number for each box. The traveler has to just look up the station in the station index, then the adjacent number. Later to look for your station in rectangular box with that number. The only problem with this method was we had to accommodate the numbers in the map as they could not be kept on borders (as one would do in the alphanumeric grid). Fig. 10: The alphanumeric grid requires the user to match the x-axis and y-axis. Works well for a dense grid. But can't we simply number the boxes for a sparse grid? 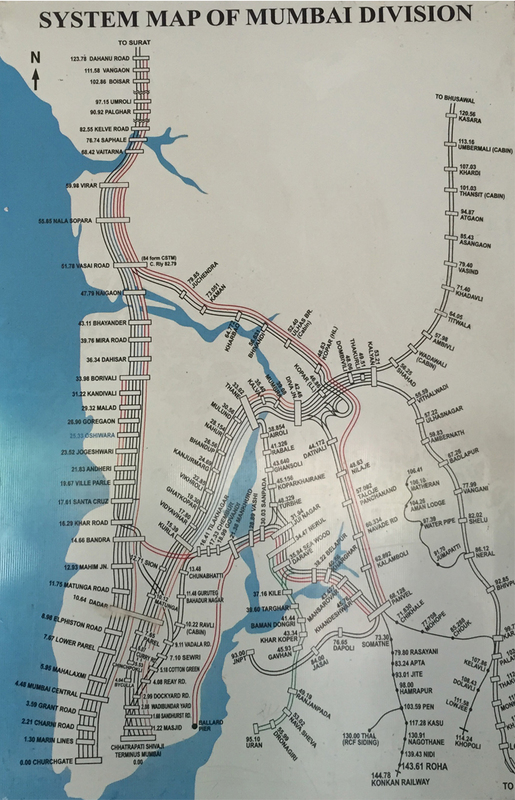 Some maps already exist for Mumbai Suburban Rail, what is so unique about your map? • Our map introduces a quick navigation system, which lets the user locate his stations within seconds using the box grid. We have introduced grid system in a different way. Its slightly modified in comparison to the traditional grid (used world over) which has alphanumeric coordinates (criss-cross relationship) eg. A1, A2, A3 and so on. This consideration was from our study of most Indians who are not accustomed to criss-cross alphanumeric grid, excluding people who have travelled abroad where the maps as well as the alphanumeric grid is very common. • We have included some geography in the map, it provides a reference to the water body as Mumbai is a island. 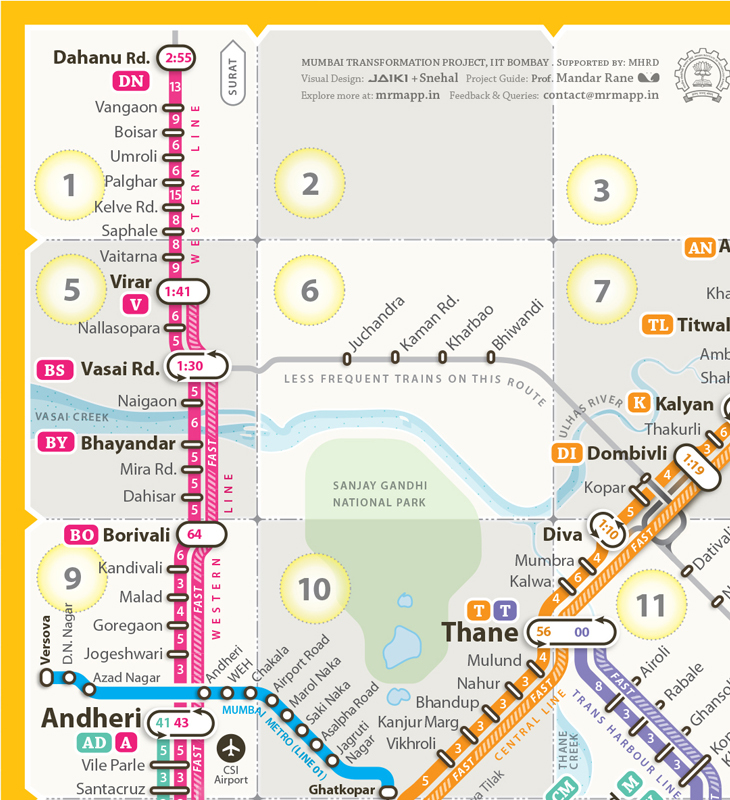 • It is the first map that integrates the Metro and Mono Rails along with the Mumbai Locals. We have included shuttle express way which runs from Vasai to Roha. • Our map clearly differentiates between fast and slow local stops which few maps provide and mentions the time between stations. • This is a colour blind friendly map. • Pleasant and appealing visual appearance where beauty is functional. Fig. 11: Part of the Version 6 of the map showing numbered grid system, slow and fast train lines and stations and the subdued geographical features that help the user orient himself in the city. 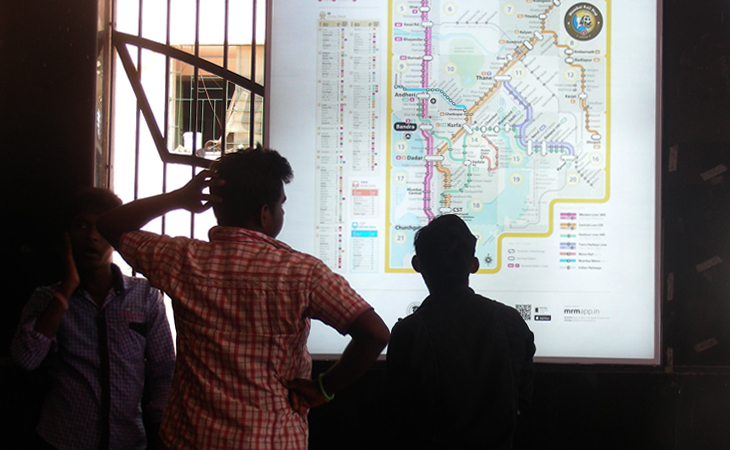 Our dream is to have such 'You Are Here(YAH) maps' installed at each station for commuters. The map should also be available in print form (see Image 5). It should also be available in print as shown in the picture below. We want the map to be portable so people can carry it with them. It will be handy for tourists. We have reduced the map to 7 x 5 cms which can easily fit into a wallet when folded. 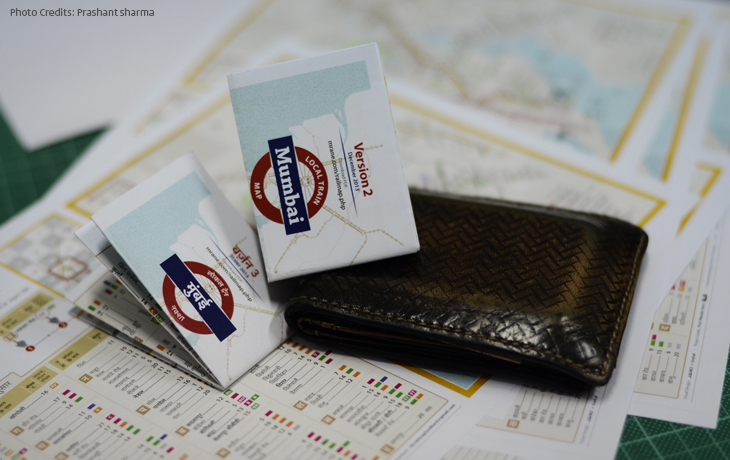 Image 5: Folded A4 maps that easily fit into the wallet and come in handy while on the move. 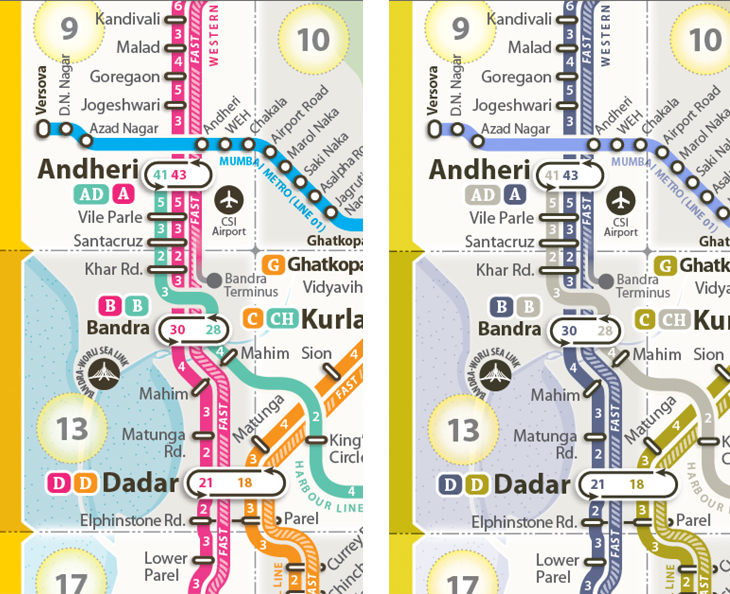 Watch the video about how the fold the Mumbai rail map after printing it on both sides. Folded version (Folded dimensions) 5 cms x 7 cms. Paper 100 gsm. How and where to install? Ideally, these maps should be installed near the ticket counters for people to see before they embark on their journey. Maps should be integrated with the ticket vending machines too. A separate map should be installed on the platforms so that the mental model of the rail network for travelers is clarified over a period of time. This is a latent need but of utmost importance. Overview of any complex systems avoids detours and the crowd is channelized systematically rather than opting for only one way of travel due to lack of information. On December 13th 2013, MRM was launched via facebook. It was shared by people and they started appreciating it. There were a lot of content errors in version 1 of the map that were corrected by crowd-sourcing the correct information. It was exciting to present a solution to the public and get instant feedback. The journey of MRM continued over a year with version after version till we released Version 5 (V5). On 8th May, 2014 MRM V5 was installed at the foot over bridges of Dadar and CST railway stations with support from Central Railway. Through the course of that week, MRM was tested by asking people to perform tasks such as, find your station and plan a journey. People were excited and tried to capture the image of the map in their mobile phones. One of the strong feedback from commuters was a need to have the map on the go, in their mobile phones, possibly a smartphone app. MRM in collaboration with Glassbox Software developed the MRM-Mumbai Rail Map mobile app for Android and iOS platforms that was released on February 14th 2015, Valentine's day, to express our love for Mumbai. An icon for ‘Love Mumbai’ was also launched on the same day. 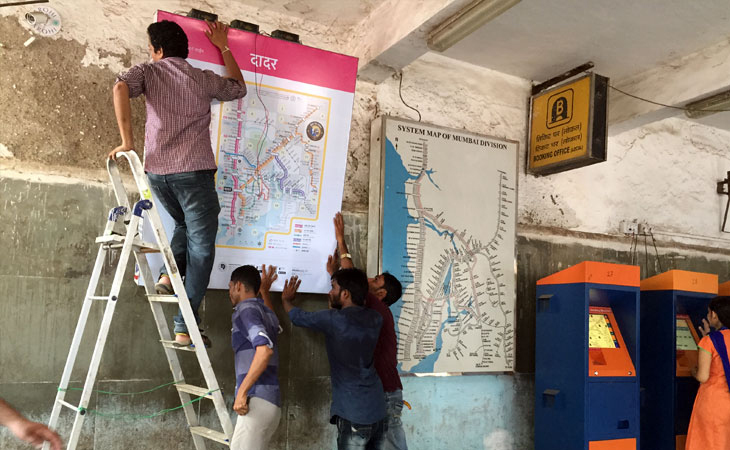 Exactly a year after the first test installation, May 9th 2015, backlit Version 6 of the MRM maps were installed for testing at Bandra (East and West) and Dadar (West) stations of Western Railway in three languages, English, Hindi and Marathi. Testing the version 5 of the Map at Dadar Railway station (east) on the Middle Footover Bridge (FOB) and also at CST on the FOB. 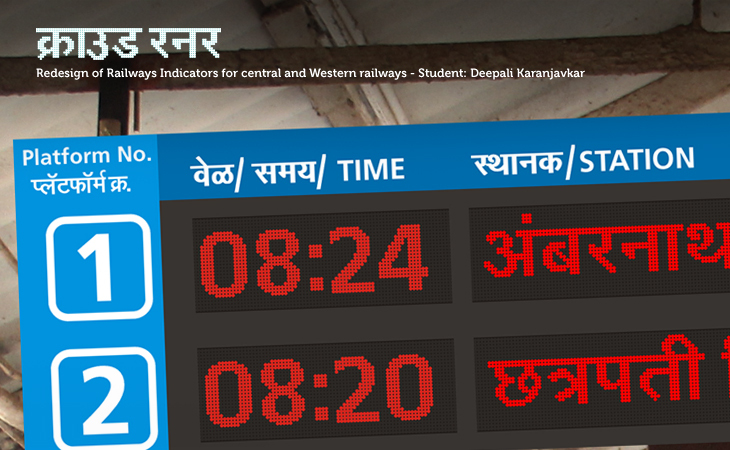 We are thankful to Central Railway for the permission to test the map at stations. We thank Shri. Mukesh Nigam (DRM) Central Railway, OSD, DCM, CPRO, PRO for their kind support. We thank our students/reasearch associates/ interns at the testing sites: Jaikishan Patel, Aditi kulkarni, Shweta kamble, Sachit Shyam, Gurunath Dhamaal, Shishir Bhagade, Kaustubh Limaye, Apoorva Pradhan, Ashwini Hiremath, Vishnupriya Kaulgud and others. Is the rail map complex?